"Since I Fell For You" evolved a great deal between its first release in 1946 and the best-known version 17 years later. Its composer, New York bandleader Buddy Johnson, debuted the song as a brass-heavy production with a vocal by his younger sister, Ella Johnson. The late '46 release on Decca made little impact at the time, but New Orleans-based Paul Gayten's rendition, with only a vocal by Annie Laurie and Gayten on piano, was a top ten Race Records (R&B) hit later that year on the DeLuxe label. When N.Y. doo woppers The Harptones, with lead singer Willie Winfield, did the song for the Bruce label in 1954, an introductory verse had been added: 'You are gone and left me all alone...you took my love and made me leave my home...,' the rest of the song lyrically following Johnson's original. Many solo singers and groups (and a few, mostly jazz, instrumentalists) offered their interpretations over the years, but the Harptones single (crediting Joe Bihari as composer under the name Joe Josea) seems to be the only one with an added set of lyrics. That is, until 1963, when Lenny Welch gave us the version that became a major hit. In the mid-'50s, a group of Asbury Park, New Jersey teenagers headed by Joe Major had hopes of making it as a vocal group; they toyed with names like The Vibratones and Mar-Keys (years before the famous Mar-Keys of Memphis, Tennessee were formed). One member, Leon Welch, decided to pursue a solo career, eventually moving to New York to give it a shot. He met Coley Wallace, a heavyweight boxer from Florida with two career highlights: he defeated future heavyweight champion Rocky Marciano in an amateur bout in 1948 and, in a sporadic film career, portrayed the previous hard-to-beat heavyweight boxing champ Joe Louis (in 1953's The Joe Louis Story). Wallace became Welch's manager, wrangling an audition for the 19-year-old with Decca Records executives, who altered his first name to Lenny and signed him to a contract. His first single, "Rocket to the Moon," was written by Lenny (under a frivolous alias, Leon Sherlock), a rock and roll song miles away from the smooth ballad style he excelled at. Flip side "My One Sincere" is a more appropriate doo wop ballad with backing vocals by members of The Shirelles (fresh off their first hit, "I Met Him on a Sunday"). Neither it nor "The Blessing of Love" caught on and he was dropped from the label. But Coley Wallace knew his way around New York, using his celebrity status to drop in just about anywhere; the next stop was Cadence Records, where Lenny's dulcet tones and obvious inclination towards romantic balladry a la Johnny Mathis impressed owner Archie Bleyer. "You Don't Know Me," the Cindy Walker-Eddy Arnold song that four years earlier had been crooner Jerry Vale's biggest seller and a country hit for Arnold, worked for Welch as well, making the top 50 in the spring of 1960. As with his entire roster of artists, Bleyer worked closely with the new signee, producing and arranging his recordings and even traveling with Lenny for performance dates, but a second hit didn't materalize right away. Regardless, people far and wide listened to Lenny Welch; his 1962 take on the Broadway tune "A Taste of Honey," penned by Bobby Scott and Ric Marlow, had an impact on The Beatles, who copied his arrangement on their version, one of the 14 tracks on the band's debut U.K. album Please Please Me. Then "Since I Fell For You," with its heartbreakingly effective arrangement by Bleyer, dropped into pop culture. A favorite of Lenny's since he was 16 and heard the Harptones do it, he was gung ho to record the song; Archie located a copy of the sheet music, which showed Buddy Johnson as the sole composer, yet an intro verse (different from the one the Harptones had used) was right there on the printed page: 'When you just give love and never get love...you'd better let love depart...I know it's so and yet I know...I can't get you out of my heart...' Those lyrics were emotionally delivered, possibly for the first time, followed by 'You made me leave my happy home...,' and listeners were hooked on the two minutes and 53 seconds of blissful agony...the only song I know of with '...you snubbed me' in the lyrics! Timing surely played into the '...misery and pain...' seeping so beautifully from the grooves of this record. 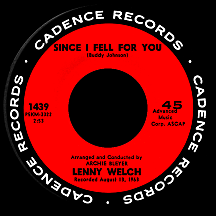 An autumn 1963 release, it premiered on the Billboard charts near the end of October; by the time of President John F. Kennedy's assassination a few weeks later, Lenny's single had reached the top 20, peaking at number four the final week of the year during what was, perhaps, America's darkest December. It's not a negative thing where the song is concerned, rather a strong nostalgic aura this and many other hit records from the same period possess that unintentionally enhances the work. The next single, "Ebb Tide" (a decade-old Robert Maxwell-Carl Sigman song), had come out more than a year earlier; a reissue made the top 30 in the spring of '64 at about the time "Since I Fell" placed Lenny in Grammy Awards contention with a nomination for Best Rhythm and Blues Recording (Ray Charles won for "Busted"). In September, Bleyer opted to quit the business while he was still ahead, putting Welch in a precarious position. The singer had joined the National Guard Reserves in lieu of being drafted; suddenly searching for a new record company, and unable to do any extensive touring due to a once-a-week military commitment, he had no choice but to stay close to home for the next six years. There were a few minor charted singles, every one a ballad. His final one for Cadence, "If You See My Love" (written by Seals and Crofts), was followed by three in 1965 on the Kapp label with producer Tom Catalano and arranger Alan Lorber: "Darling Take Me Back," "Two Different Worlds" and "Run to My Lovn' Arms." After a short stop at Mercury Records in 1968, Lenny appeared on the Commonwealth United label, returning to the top 40 in early 1970 with a soft rendition of Neil Sedaka's uptempo '62 chart topper "Breaking Up is Hard to Do," arranged by Charles Calello of 4 Seasons fame. The approach used was reminiscent of "Since I Fell For You," with an added introduction setting the song's mood: 'You tell me that you're leavin', I can't believe it's true...darling there's no livin' without you...' Sedaka was so taken with Welch's version that he remade the song the same way, hitting with it a second time in 1976. 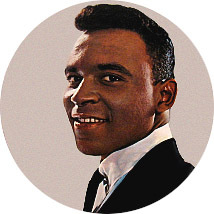 Jumping from label to label for most of the '70s, his final chart single came in 1972 with "A Sunday Kind of Love" (a 1946 romance classic penned by Barbara Belle, Louis Prima, Anita Leonard and Stan Rhodes), which had been a well-known 1953 doo wop recording by The Harptones and a favorite of Lenny's long before his predestined connection to the group. In the years since, he's performed around the world, been heard singing on a number of television commercials and even done some acting, playing a detective on the ABC-TV soap General Hospital in the early '90s. 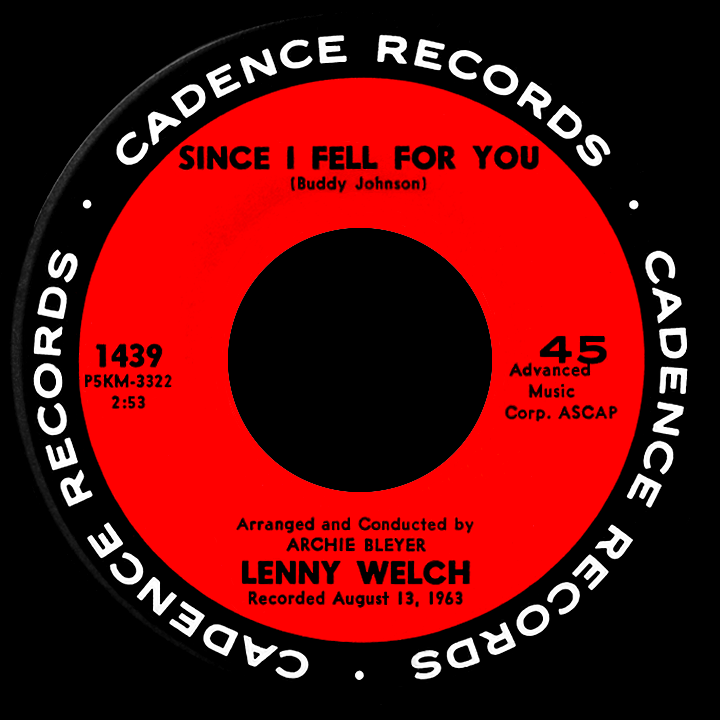 Lenny Welch's greatest claim to fame, "Since I Fell For You," so distinctly different from Buddy Johnson's original and other early versions, has prompted modern artists to have to choose between two options, Lenny-style with the intro or Buddy-style without, and it's commonly performed both ways.